Experienced business owners and novices alike appreciate that taking on and managing work-based projects can be a time-consuming drain on resources. You’ll often have tough deadlines to work towards, and completing projects on time can be hard to organize efficiently. The traditional methods of project management just aren’t good enough anymore. Typing information into spreadsheets, using word processing software to compile notes, and recording meeting minutes on paper are tasks that are too laborious, and take an enormous amount of time. But there’s a new wave of project management tools that have the ability to change this and make organizing your projects far simpler. In many cases, they can let you perform a ton of useful things - such as delegating tasks, creating trackable to-do lists and accessing progress reports - in one easy-to-handle piece of software. In this article, we’re going to look at some of the best project management solutions for your business. We made our choices taking into account pricing, features, professional reviews and user experiences. 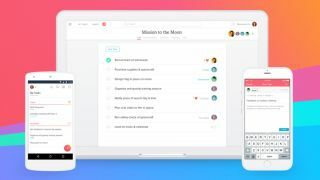 Asana is a project management solution you may have heard of – even if you haven’t used the service in the past. While it offers a ton of handy features to boost productivity, there’s a bigger emphasis placed on tracking. The app lets you create to-do lists and reminders so you always meet deadlines, plus you can add due dates, colleagues, instructions to tasks, and comment on items. You can even share images from other apps (like Google Drive) directly to Asana. And more importantly, you can actually track everything you and your colleagues work on in a bid to ensure the project is running smoothly and to schedule. If you’re concerned with who is working on certain projects, then you can bring up a list of teams and individuals, and there’s also a search functionality so you can find completed tasks easily. Asana offers a free Basic tier, with limited functionality and dashboards. Step up to the Premium tier, and for $9.99 (around £8) per person per month billed annually, you get unlimited usage with no team member limit, and more functionality including the new timeline feature as well as custom fields. LiquidPlanner has a robust feature set for enterprise-grade project management, boasting corporate customers which are leading Fortune 500 firms including Bayer, Cisco and Daimler. Features include the Smart Schedule that can assist in prioritizing work, assigning people resources, and then estimating the hours needed for completion, which then allows the project to be tracked given the hours devoted to it by the assigned workforce. Conversely, the Resource Management feature can show the hours put in by each worker, and track who is available to assign to the next project. All of this data feeds into easy-to-read dashboards that can integrate in financials and trends. However, all these advanced project management capabilities command a substantial asking price with the lower Professional tier costing $45 (around £35) per month per user, on an annual basis (with a five user minimum). Note that there is a free 14-day trial to take LiquidPlanner out for a test drive before you commit. Over the last few years, Trello has emerged as one of the most popular project management applications. It lets you organize all of your work-based and personal projects through a computer, tablet or smartphone. Trello is notably used by the likes of Fender, Google and Kickstarter. You’re able to set up boards to organize everything you’re working on, delegate tasks among colleagues, get customized workflows, add to-do lists within task cards, attach files and comment on items. The idea is that you manage all aspects of a project within the app, regardless of whether it’s team-based or individual. Both Windows and Mac desktops are supported, with mobile apps available on Android and iOS devices; there’s even a version that’s been optimized specifically for the iPad Pro. The latter sports a larger canvas and a variety of handy email shortcuts to speed up projects. It’s free to download to give it a spin, and can be used on the free tier, although there is a 10MB limit on the size of file attachments. The upgrade tier is Business Class that supports attachments up to 250MB, and offers additional features for $9.99 (around £8) per month per user, including one day email support, and integration with other services such as Google Hangouts and Slack. Podio has been designed for professionals who are always working on multiple projects and generating new ideas. More than 400,000 businesses and teams from across the world are using it, including the likes of Sony, Volvo and the NFL. With the Podio app, you have the ability to create tasks and customize them based on your workflow, taking into account deadlines and responsibilities. There’s also a built-in instant messaging function which you can use to share ideas and see how others are getting on with delegated tasks. Additionally, there is a handy tool for getting quick feedback without having to send several emails. There are integrations with third-party services such as Dropbox and Google Drive, meaning you can share content quickly and easily. Podio is available in a number of additional languages, including French, German, Danish, Chinese, Spanish and Russian. It’s free to download the app, with the option of accessing in-app purchases. On the web, there is a free tier with a limit of up to five team members. The Basic plan starts at $7.20 (around £6) per month, when paid on an annual basis. Basecamp is one of the oldest project management solutions, having been around for more than ten years, building a reputation which makes it a highly credible tool for businesses that work on big projects. There are some nifty functions for dealing with clients, too. For instance, you can easily save and track client feedback and approvals, and you can also get reports on how projects are going. And when you want to collaborate with others, you can create group chats. While the app is free to download, there is only one business plan that costs $99 (around £78) per month, although it includes all the features, and an unlimited number of users, making this a great deal for a larger corporation, but pricing out small businesses. Evernote is one of the most reputable apps for boosting productivity, both on a personal and professional level. And while it’s not strictly a full-on project management app, we believe it’s worth mentioning on the strength of being a great companion app when it comes to managing a ton of complex, time-sensitive business projects and tasks. The app gives you all the tools you could possibly require in order to keep organised and stay on top of tasks. You can write and save project ideas as notebooks, checklists, searchable notes and to-do lists. However, they needn’t just be text-based, as there’s the option of adding sketches, video, audio, PDFs and web clippings. Everything is synced across devices via the cloud, and you can use your smartphone’s camera to scan items such as business cards and handwritten notes. The premise here is that Evernote acts almost like a personal assistant. There is a free Evernote Basic tier, and the lowest priced Evernote paid plan (Premium) costs $7.99 (around £6) per month with no annual commitment, which is affordable for the services offered.